In the heart of the city, the residence Residhome Monceau is located in the new district of Monceau and benefit all facilities and shops. Close to business district of La Defense and Paris Saint Lazare. 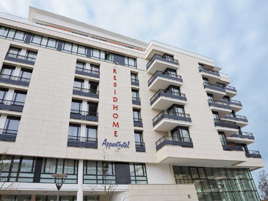 The aparthotel in the new Monceau neighborhood is close to shops in the town center and benefits from all the conveniences and access to public transportation. Come take advantage of the Parc des Bruyères, the "green lungs" of the town with its 2 hectares. It's a unique place to take a walk or just relax in the center of a beautiful and harmonious new neighborhood.